The content you are trying to view is for members only. We invite you to join today. The Caring Generation® focuses on the conversation of caring; giving us permission to talk about aging, the challenges of caregiving and everything in between. Where we live, our family structure, our individual backgrounds and character are all factors impacting our daily lives and the world at large. We are all caregivers of some sort, some by our profession and some by our personal relationships. We all have the ability to become more educated and to positively impact the lives of those around us. By keeping our minds open to the benefits of education and collaboration, we have the opportunity to make connections and to implement ideas to benefit current and future generations. At the time we need care or we become a caregiver, our world is turned upside down. There is little dignity, little clarity and very little stability. Let’s be honest, most of us prefer a life without change – it’s no surprise that needing care or becoming a caregiver changes everything. The Caring Generation is here to walk with you along the journey of care. To let you know that you’re not alone, you’re in exactly the right place to ask questions, receive education, learn tips and resources to help you and your loved ones plan for what’s ahead. 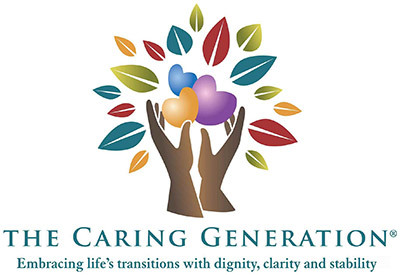 The Caring Generation® is committed to supporting family and professional caregivers. We believe that the best way to deliver on our commitment is through membership and partnership. We are avid investigators and advocates. We seek to provide current information relevant and beneficial to our members. Education and information on our website is in our library featuring FREE Resources and Member Resources. We also offer a Store where you’ll have access to tele-seminars, podcasts, videos, private sessions, articles, books, workbooks and more. We offer members the opportunity to participate in surveys to provide us with feedback so that we can respond to common interests. Our Collaborate section includes a forum based on established categories of information. Members also have the opportunity to join The Caring Generation on Linked In to collaborate and meet other individuals throughout the world with similar interests. By establishing a reciprocal relationship with our members, The Caring Generation has the goal of transforming into a worldwide movement to support caregivers and caregiving advocacy through education. Subscription is FREE. You’ll receive access to our Member Resources and Store, offering the opportunity to purchase and participate in education and related events. Your information remains with us and is confidential and protected. It is not sold, offered or shared with any businesses or individuals outside of The Caring Generation. You must be a member of The Caring Generation to access our Member Resources, Store, and Forum and to purchase education and programming. If you share your information through the forum by posting or responding to questions, your username(not your email address) becomes available through the forum, however other participants have no way of contacting you personally outside of the forum. Note: If you choose to share comments through the social networks associated with The Caring Generation site, your information as registered through the social network does become available and visible to others on these social networking sites. Pamela D. Wilson provides information and education specific to caregiving based on over a decade of practical experience and work with individual caregivers, those needing care and professional caregivers. Care advocacy is still relatively an unknown concept. Many individuals, until they become caregivers, lack knowledge of the complexities of the healthcare system nor do they realize how quickly family relationships become strained due to needed or expected care. The information in The Caring Generation library offers practical education and insight not available elsewhere for both family and professional caregivers. You’ll discover a wide range of caregiving topics and ideas, stories and interviews about caregivers, interviews with physicians, healthcare policy experts, caregivers and individuals from a wide range of backgrounds and possessing expertise in the healthcare and caregiving industries. Information is available in print, audio and video formats. Membership also provides the benefits of free subscriptions to our newsletter and other special publications and offers we make available to members. You are invited to join and to share access to our site with others. Click on the BECOME A MEMBER button below and you’ll be taken to a page where you can enter your information and begin enjoying the benefits of FREE membership. Thank you for sharing your caregiving journey with us.